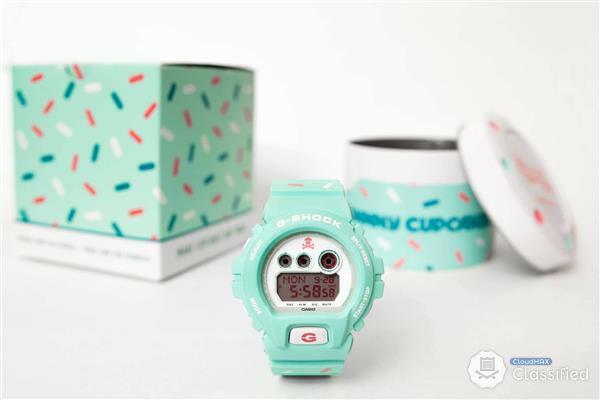 G-Shock Japan just released these photos of the upcoming Johnny Cupcakes x G-Shock GD-X6900JC-3 collaboration watch. Johnny Cupcakes is a clothing brand known for its humorous t-shirts and skull and crossbones logo featuring a cupcake instead of a skull. The GD-X6900JC-3 has a retro-like aqua or seafoam green color with white lettering, a white face, and a standard LCD display. The bands have a printed sprinkle topping pattern (of pink, white, and blue sprinkles) and there is a pink Johnny Cupcakes logo on the face. The G on the backlight button and the band keeper are pink. The case back has an engraved Johnny Cupcakes logo and the backlight has a dripping frosting graphic. Also included is a custom Johnny Cupcakes tin and box. The watch is based on the fashionable large-size GD-X6900 model featuring a 10-year battery. Brand New In The Box with Tags. Limited edition and 100% original item. E-mail: n1r@n1racing.net or contact Desmond +60192149006 or +60122159006 for more information.